1 Comment on How much would it cost to go to Australia for two months? People often ask me how much I spend during my travels. Each person has their own way of traveling, therefore the travel cost will always be relative. However, two months should be enough to make a few assumptions, and during the whole trip I kept record of all my spendings. But, how much does it really cost to travel in Australia for two months? One of the top 5 most important things to take into consideration is definitely transportation. Even if you want to sleep under the stars, beg to eat, or go to the extreme of carrying a 20kg bag of rice to eat only that during two months…, you’ll always need some money to fly to the other side of the world, and even to travel inside Australia, which is a gigantic country! But still, going with Flying Blue (KLM, Air France, etc) would be too expensive, and the trip would also be too long. I would have to make a stop in Dubai or Abu Dhabi for a day, which wouldn’t be that terrible and I even considered that option. But then I looked into the destination. From which Australian city would I start my trip? I found return flights to Sydney from Cork (with several layovers) for about 1700€[email protected]… Then I looked into other cities, and by a friend’s recommendation I then found return flights by exactly 1000€ to Melbourne! But instead of Flying Blue, I would use British Airways (with whom I had fewer miles), but the difference of price was quite significative. 700€ less is a lot of money! So my flight ended up being Cork > London > Singapore > Melbourne, with return to Lisbon. All of this costed me exactly 1000€! But obviously I had to book more flights, I still had to return to Ireland, but I just had to book a flight with Aer Lingus from Lisbon to Dublin, and that was only by 65€. How about domestic flights in Australia? My goal was to travel around Australia only by land, though I ended up booking one flight from Adelaide to Melbourne, really by the end of my trip, and only because I wanted to spend more time around Melbourne. For that I would need to save some time, therefore I flew with Tigerair (now merged with Scoot) from Adelaide to Melbourne, and that one-hour flight costed me 43€. I did flew a few other times in Australia, though only for leisure. A sky dive, and a flight to and from a desert island, though those flights were all included in the travel package I made when I arrived in Australia, more details below. Traveling in Australia is almost like a science by itself. When I researched about which ways would be the best to travel in Australia, the most interesting options I found were by train or by camper-van. Though traveling by camper-van alone would be quite pricy, and considering the distances between major cities, that would also be quite tiresome. Even though I would always have where to sleep, driving a camper-van for 10 hours alone would be insane… And to add to all of that, the chances of having an accident or any other delay would just add more stress to my trip. But still, there is an epic train route that I really did want to do, The Ghan, which crosses the Australian continent North to South. The problem with this route is that it only runs once a week in each way, and there were two stops along that route that I really wanted to visit. So I had two options, or I would only do part of that train route and the rest by bus (or any other way), or I would also have to disregard this adventure. Once I saw the ticket price for The Ghan, my decision became easier. I did it by bus. Thankfully in Australia tourism is really strong and popular among the younger generations, so there are loads of options to travel anywhere. On what regards the buses, I ended up by going with Greyhound, considering they have a really good bus network in Australia, mostly in the areas I wanted to visit. There are other agencies, though I ended up going with these one because it is one of the most known. I purchased three hop-on hop-off tickets, each valid for three months since the moment of the first trip. Why three tickets? Because we can only use a ticket in the same direction, and we must choose which routes we want to take when we book the tickets. So I purchase a ticket from Melbourne to Cairns (north of Australia), which also included 10 night-stays in a very well-known hostel chain (702,78AUD). A ticket from Cairns to Alice Springs (center of Australia) for 382,50AUD. And a ticket from Alice Springs to Adelaide (219,30AUD). And with all of this, I had my itinerary in Australia set and assured, even before I left Ireland. So in total I spent around 1305AUD, which was about 940€. Regarding public transportation, I had to use it in cities, mostly in Sydney, and once or twice I even had to take a taxi. In Melbourne the trams are free within the city center! It’s excellent to save your shoes! In total, also with the ferry to Magnetic Island (which costs 32AUD, about 20€) I spent 140AUD (93€) in public transportation. Not bad, considering I spent two months hopping from place to place! It’s important to note that you can take a train from Sydney to the Blue Mountains, but from there only hitch hiking from place to place. I am not sure if there are buses taking tourists around all the sightseeing places in the Blue Mountains. But you can take that same train and visit Featherdale Wildlife Park, which was exactly what I did. From the train station, you just need to take a bus to the park. And this is where my money was well invested… And that started right on my first day, where I booked tours for the whole trip… That wasn’t the initial goal, but oh well, I ended up doing that mistake (or maybe not). In total I spent 2160€ in a tour package that included several activities, like three days and two nights sailing, a sky dive, and several other things! Then some other activities were added by myself, like some excursions and museums. In total I spent an extra 492AUD (330€). In this value I am also including the photos I bought part of those same excursions. Of all activities, there are a few that I really think are worth mention in this report, and are part of those extras I ended up paying for. For example, my tour to Fraser Island, on a very last minute I decided to stay one extra day on the island (probably one of the best decisions I have ever done while traveling), and for that I had to pay an extra 100AUD, around 67€. For my sky dive I also ended up adding up an extra, since I wanted all photos and video from a frontal perspective, not the wrist-camera view, I had to pay extra for another person to jump and record everything right in front of me. Again, another one of my best decisions ever, but I also had to pay for it… 294AUD extra for the jump, 192€, plus the photos and videos which was another 70AUD… And now that I put all these numbers together, I think it was really expensive… But it isn’t every day that you sky dive over the Great Barrier Reef, and land on a beach. That is not that priceless, it was actually expensive! And the very next day after my sky dive, I did another kind of dive, but to the bottom of the ocean! The Great Barrier Reef, where I did my first scuba dive! The first dive was included in the initial package, but the second one was optional. Though snorkel would be free. But since I loved so much the scuba diving, I decided to not look into my bank account, and I paid an extra 55AUD (37€) for the second dive, which ended up being an even better experience than the first one. Another activity I paid extra, because it was not part of the initial deal, was a surfing class in Surfers Paradise…, yes, that’s a massive cliché, but I had to do it…, for that I paid 45AUD (30€). Now that I am looking properly into my expenses, I noticed that I really eat a lot and it seems I also love to sleep! Excluding the tour packages that I purchased, my highest expenses were in food! 1096AUD!! (747€). In fairness, spending this in two months isn’t that bad, and I cooked a lot in the hostels and I took the leftovers with me to save some money. And it seems that it was a wise decision, I had no idea that food would be such a big share of my expenses… And I guess it is also important to note that I only ate out once or twice, in restaurants. All the other meals were either fast / cheap food, or cooked by myself. On what regards the accommodation, I indeed had cheaper options, like camping. 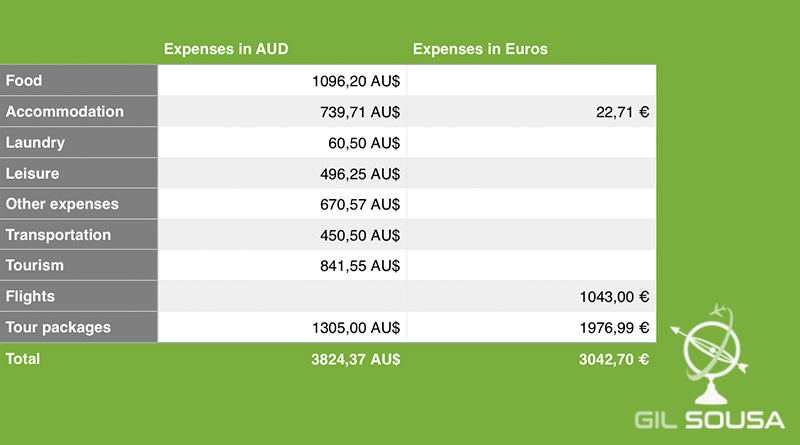 But 8 weeks travel in Australia, spending 740AUD (504€) was a really reasonable value. Of course I had some nights included in the tours, like two nights at Fraser Island, then two nights at the hostel before and after the trip to Fraser. The two nights sailing, and the 10 nights included in the bus ticket from Melbourne to Cairns. But if we assume I spent around 500€ for those nights, that won’t be more than 10-15€ per night. I guess that’s a really nice deal! Part of the accommodation expenses go to laundry. Yeah, exactly! Laundry! Two months on the road always carrying the same clothes, one must wash it every now and then… And to be honest, or maybe it was my OCD, but I had it really well-organized. If I had a tour that would take me to a desert island for 2 or 3 days, or sailing, then I would have to get ready for that, and maybe do laundry before that new adventure. To the point I even had a laundry calendar…, yep, that’s true! In total I did laundry 8 times, in average once a week, because I was traveling quite light, therefore I had to do laundry a bit more often… And with the detergents, and the drying, I spent 60,5AUD (41€). For the “Other” category I put everything else, like shower towel, because someone stole mine… I am still up to understand why would someone steal a shower towel… I also had to buy a SIM card, an SD card for my GoPro, and top up my phone a few times so I could have data. The gifting part also went to the Other category, but that was just by the end of the trip. Looking at my expenses list, some of my shopping was mostly groceries, and those expenses should be included in the food category, but since I didn’t have that detailed, I ended up adding it up as “Other”. With all those few extras, I spent 670AUD (548€). This is one of the questions I get asked the most, how much does it cost the tourist vista to Australia? For a Portuguese? The answer is quite simple, it’s free! Alike other nationalities, Portuguese people can travel up to three months in Australia with a free tourist visa, though you need to apply to it in advance. To summarize all what was said above, with flights included. In Australian Dollars, I spent around 3824AUD, which is about 2618€. Regarding expenses I paid directly in euros, like with the debit card, the value was slightly above that…, 3043€. So in total, I guess I spent something like 5660€. To be absolutely honest, when I started planning for this trip I was counting on spending around 10 000€. According to my math, that would be more or less how much I would probably need. But I was also expecting a more expensive Australia than the one I visited. Maybe the fact that I assumed that I would spend a lot of money made me be a more reserved regarding spending too much. But in fairness this route has a reputation, I heard it so many times that the East Coast is the rich backpackers’ route. And in fact, there is a lot of tourism targeting backpackers, and loads of parties. Once in a while, that’s ok, but often…, one needs to be rich to be able to afford that. Most of the backpackers I met are young people who traveled to Australia on a holiday-working visa, a deal between the Australian government and several other nations, and really popular among Irish and British, though hopefully it will also become popular for the Portuguese! A pity that one must be under 31 years of age…, or I would take my chances. With this special visa, young people can travel for a full year and be allowed for a few short term jobs, so that they can keep travel. Like working in hostels, bars and in the tourism industry. And to conclude, looking at all my expenses, it might seem a lot for a two-month experience, though it is also important to look into detail into my expenses. It’s all based on my personal experience and my way of traveling, there’s a chance that some of the activities I did try aren’t your cup of tea, or places I chose to sleep in, and so on. This article is just a personal perspective and overview of how much a trip to Australia might cost. For another person, these numbers could be completely different. I just have one more thing to say, it was an amazing trip, and the only thing I regret is not having done it sooner. If you have the chance, I highly recommend to embrace such an adventure. is ver nice the experience- Muy bueno todo ojalá pudiera visitar tan bello lugar.